Doing some prep for my Algonquin College Sports Business Management class this week, where we're talking about the role of music in sports. Found this interesting article about how the St. Louis Blues re-acaquired the original stadium organ. This article appeared on CBSSports.com in January, 2013. For a franchise with an identity so closely tied to music, the St. Louis Blues organization must have been overjoyed when it reclaimed an important piece of its musical heritage. Chris Kerber, the radio voice of the Blues, tweeted Tuesday that the team had reacquired the organ that used to fill old St. Louis Arena with its upbeat melodies and St. Louis staple When The Saints Go Marching In. According to team COO Bruce Affleck, he had received a message from an old family neighbor who was in possession of the same organ that long-time organist Ernie Hayes used to play at Blues home games. "His dad ended up with the organ, not sure how," Affleck explained in an email to CBSSports.com. "The message said, 'Bruce, this is Bob Dienstbach and I just wanted you to know we are putting this organ Ernie Hays used to play at the old Arena on Craigslist.' "
Seeing an opportunity to reclaim this important piece of team history, Affleck jumped into action. "I called right away and left him a message and said we would buy it sight unseen, which we did," Affleck said. He did not disclose the amount paid. According to a Jan. 3 report from KPLR in St. Louis, Dienstbach listed the organ online for $1,000. 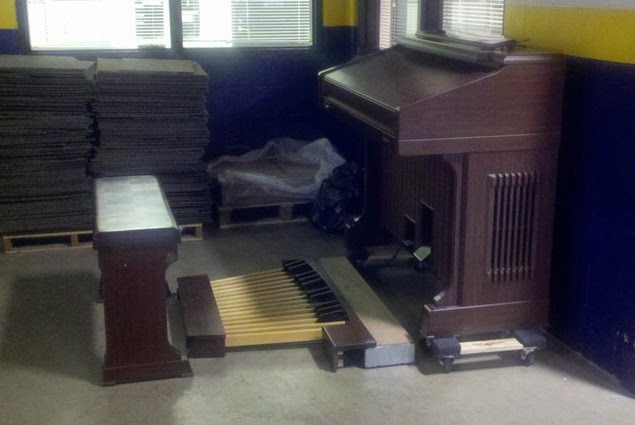 The organ was delivered to the Blues on Tuesday. Also according to the KPLR story, Dienstbach and reporter Patrick Clark inadvertently uncovered a floppy disk and hand-written notes in the organ's seat. The disk included original music they believed to be recorded by Hayes, which is playable from the organ. According to Affleck, the team's current organist, Jeremy Boyer, was a protégé of Hayes'. The former organist was a St. Louis institution, playing for both the Blues and Cardinals for many years. Hayes passed away last October at the age of 77. UPDATE: According to team spokesman Rich Jankowski, Hayes' old organ will not be replacing the one currently in Scottrade Center, but the plan is to "use it at some point." Now that the instrument that helped make Hayes a local legend is back in the rotation, fans can think back to the days when the in-game entertainment consisted of the hockey on the ice and the organ music in the air.